Table Ninja II is an auto hotkey program designed to make your multi-tabling experience smoother. You can focus on playing more tables, thereby increasing your efficiency and profitability. We recommend TableNinja II for all players who play multiple tables at a time and would like more game play options. Table Ninja II is very easy to download from the HM Apps Store and although there are many options to go through when setting up your software for the first time, everything is clearly laid out and easy to use. The main setup features include Hotkeys, Preset Bets, Annoyances, Display, SNG Sensei, and Setup. The Betting setup allows you to see how powerful Table Ninja II can be, as there are hotkeys available for almost any scenario you can think of. The Table Control setup is one of the newest functions and allows you to organize your tables better. You can preset it for Stack, Tile, Cascade, Ninja Tile, or None. There are also hotkeys to change this while playing, which is helpful if you want to stack intially, but decide mid-session to tile your tables. There are also a few other useful items in this setup including establishing hotkeys for cycling your tables. The Preset Bets setup works similar to the Betting setup except it is basically defaulting you based on certain criteria. It is very easy to override this using other hotkeys or your mouse, but this definitely should save plenty of mouse movement if you tend to do the same types of betting amounts in similar situations. The Annoyances setup is different than the hotkeys setup for annoyances. Here, you can set up whether you want to auto-click your time bank, never sit out of tournaments or cash games, and auto-close pop-ups automatically. You can also automatically take a seat in cash games, have Table Ninja auto-buy you in for a predetermined number of big blinds or percentage of the maximum buy-in, and automatically seat you from waiting lists depending on the number of tables you are already playing on. There are also a few tournament annoyances as well including auto-rebuys, auto-add-ons, and auto-closing. In the Display setup, you can ask Table Ninja to display in the upper left corner the number of big blinds you have, and for tournament and sit and go action what your “M” is. If you are playing multiple tables at once, it saves time figuring out how deep or shallow your stack is with this information clearly displayed. Perhaps our favorite part of Table Ninja is SNG Sensei. Here, you can have Table Ninja register you for a certain type or types of sit and gos based off how many you want to play at once. 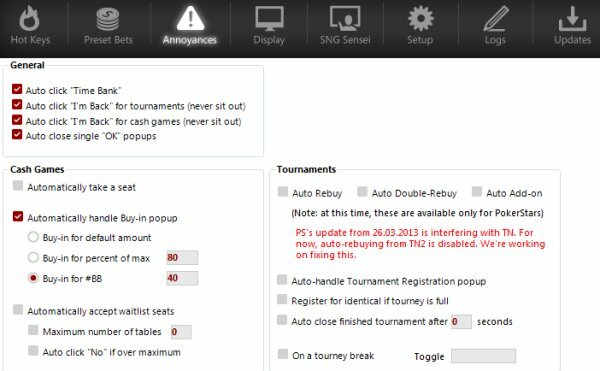 This feature also can stop registering you once a certain time limit has passed or a certain number of tournaments have been entered. There is also a feature to use your color-coded notes to designate if you want to register for sit and gos with a certain number of predetermined fish or avoid ones that have a number of predetermined sharks. TableNinja makes multitabling so much easier. It was super easy to set up and is fast and reliable. Great program.